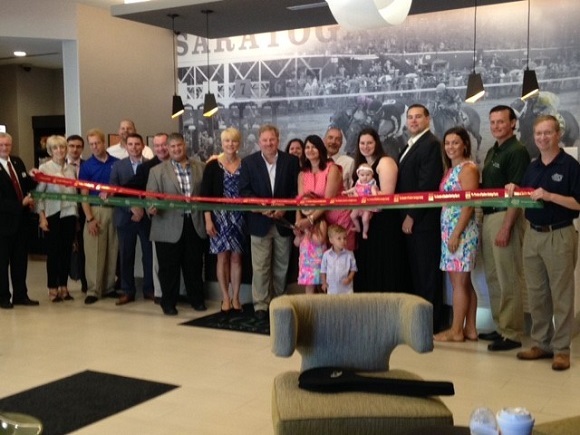 We joined in celebrating the Grand Opening of the new LaQuinta Inn & Suites located at 1749 Route 9 in Clifton Park. Pictured center is owners Mary Anne and Tony Casale along with family, friends along with Peter Smith, General Manager and staff. On hand to celebrate the occasion was Adam Kramer, representing Senator James Tedisco; Assemblywoman Mary Beth Walsh; Clifton Park Town Supervisor Phil Barrett; The Chamber of Southern Saratoga County President/CEO Pete Bardunias and Chamber Ambassadors-Rich Griesche from Catskill Hudson Bank; Judy Brinkman, owner of Life’s 2 Short, LLC; Rick Noel, owner of eBiz ROI, Inc. and Randy Hagen from Ballston Spa National Bank.